Sauerkraut and applesauce complement these pork chops with bold flavors, and it's a quick and easy recipe to prepare and bake. Use good quality refrigerated sauerkraut if possible, and if you have several apples, you might consider making homemade applesauce the day before. See the tips for easy directions for homemade applesauce from your slow cooker. The caraway seeds add complementary flavor but feel free to omit them if you aren't a fan. Another ingredient that goes well with pork and apples is fennel. Slice a fennel bulb thinly and add it to the skillet along with the onions. Add a thinly sliced apple to the skillet, if you'd like some fresh apple flavor and texture. For additional color (and flavor), add matchstick or thinly sliced carrots to the skillet with the onions. The recipe calls for bone-in pork chops, but boneless chops are fine. Meaty country-style pork ribs are excellent in the dish as well. Lightly grease a shallow 2 1/2 to a 3-quart baking dish. Sprinkle the pork chops lightly with kosher salt and black pepper. Heat the olive oil in a large skillet over medium heat. Cook the pork chops in the hot oil for about 8 to 10 minutes, turning to brown both sides. Remove the pork chops to a plate and set aside. Peel the onion and cut it in half lengthwise. Cut the onion halves crosswise into thin slices. Add the onion slices to the same skillet and cook, stirring, until the onions have softened and are lightly browned, about 8 minutes. Meanwhile, in a bowl, combine the sauerkraut, caraway seeds, applesauce, and apple juice. Spoon the sauerkraut mixture into the prepared baking dish. 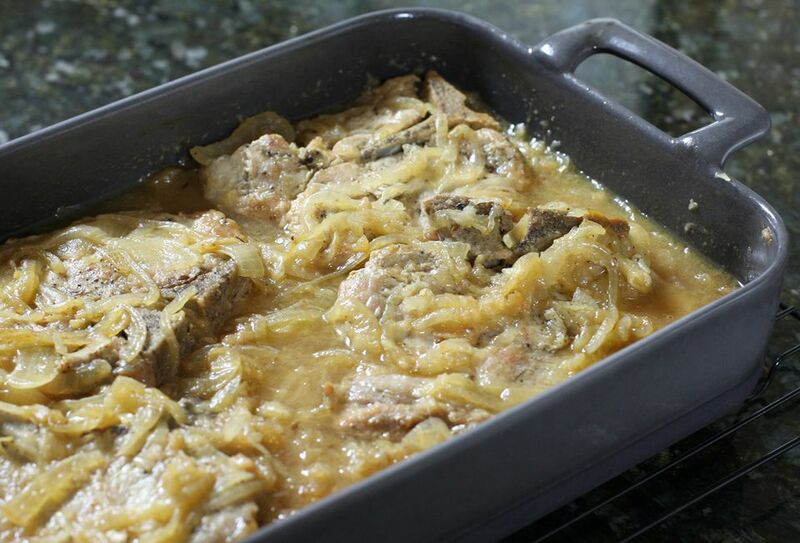 Arrange the pork chops on the sauerkraut and then top them with the browned onions. Cover the baking dish tightly with foil and bake for 45 minutes. Uncover the baking dish and bake for about 10 minutes longer, or until the pork chops are tender. Garnish with fresh chopped parsley or dill, if desired. Serve the pork chops and sauerkraut with potatoes or spaetzle and a side dish casserole or salad. Sliced fresh tomatoes are great if they're in season. Or serve the dish with fried apples and steamed green beans. Refrigerated sauerkraut in jars or pouches is usually the best quality. These are sometimes found near the deli. Shelf stable canned sauerkraut is pasteurized, killing the beneficial bacteria and vitamin C; the flavor may be there, but many of the benefits are lost in the process. To make homemade applesauce, peel, core, and dice about 12 cooking apples. Combine the apples in the slow cooker with 1/2 cup of water, 1 teaspoon of cinnamon, if desired, and about 3/4 cup of sugar. Cover and cook the applesauce on low for about 8 to 10 hours. Use 1 cup of the applesauce in the pork chop recipe and refrigerate the rest to use in desserts.